White lightning. Liquid razor blades. Chinese firewater. These are just some of the phrases used to describe baijiu, the most popular alcoholic drink you've probably never heard of. The transparent, highly potent drink is commonly found at banquet tables throughout China, where it is thrown back to cries of "ganbei," Chinese for bottoms-up, in rapid fire, spasm-inducing shots. Baijiu (pronounced 'bye-jyoh') is by far the world's largest spirit category by sales-accounting for $92.4 billion in 2012, according to the International Wine and Spirit Research group. That was well above the second-most popular drink, vodka, which saw $48.9 billion in sales. Still, it's tough to find on U.S. shelves. That may soon change. 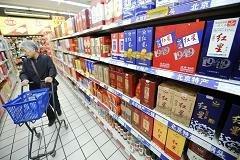 London-based beverage giant Diageo (London Stock Exchange: DGE-GB), which acquired a controlling stake in the popular Chinese baijiu brand Shui Jing Fang last year, was granted permission by the Chinese government last month to buy remaining shares from its Chinese partner, and it is looking to break the sorghum-based liquor into the U.S. market. Meanwhile, small distilleries like Byejoe Spirits USA in Houston and Vinn Distillery in Portland, Ore., are pushing versions of the drink. Diageo is starting with airport duty-free zones and Chinese tourists, before targeting non-Chinese buyers outside of travel retail locations, spokeswoman Camille Dor said. She added that while the U.S. baijiu market is in "an early stage of development," Diageo sees an opportunity to broaden the drink's appeal to both the Chinese diaspora as well as America and adventurous experience seekers. According to Diageo, 10 percent of Shui Jing Fang's sales are made outside of China, and the brand is already sold at more than 40 airports worldwide. Dor says that Americans' lack of a traditional alcohol to pair with Chinese cuisine also represents an opportunity. "Sake has become ubiquitous with Japanese dining and tequila with Mexican," Dor said. "Chinese cuisine has never had this natural complement. We see a great opportunity to change this." Matt Trusch, CEO of Byejoe Spirits, echoed this sentiment. "You go to a bar and you see tequila from Mexico, vodka from Russia, sake from Japan, scotch from the U.K., and you're wondering, where is the baijiu from China," Trusch said. According to Trusch, baijiu hasn't made it big in the U.S. because of its high-alcohol content. It typically ranges from 50 to 65 percent by volume, compared with about 40 percent for rum or vodka. He said the tradition of consuming baijiu in the "straight up" shots drinking style may also be a factor. Trusch said that to change this, he has formulated his 'byejoe' baijiu to appeal to American palates. Trusch's company imports baijiu from Chinese partners, then filters it in the U.S. to bring its alcohol content down to 40 percent, a level that Trusch says makes it an ideal mixed drink ingredient. Trusch's mix-friendly byejoe is sold in Texas and Florida, and the company plans to expand to California by the end of 2013. Trusch said his company has been discriminating in its distribution, selling to select "trendy" hotels and bars in cities like Miami, in order to build a hip, young image. "If you look at people of a certain age, who are set in their ways, those people would choose what they know. We're targeting people from 21 to 35," Trusch said. To be sure, not everyone is bullish on baijiu's prospects, at least in the short term. "It has a very strong flavor. Some might describe it as a moldy flavor," said Frank Coleman, a senior vice president at the Distilled Spirits Council of the U.S. "It's not something that would necessarily appeal to the American palate." Coleman says tradition also has held baijiu back. "Our products are designed to sip slowly, not just simply do shots," Coleman said. "The notion of 'ganbei' is sort of opposite of that." "It's definitely an acquired taste," said Tom Mullarkey, a senior beverage analyst at Morningstar. "It will stay a small part of the market for the next year, five years, ten years." Still, byejoe says it has sold more than 2,000 bottles, which retail at $29.99, since launching earlier this year. And with establishments like retired NBA star Yao Ming's YAO Restaurant & Bar offering its products, the company expects sales to accelerate. "It's selling pretty well," said Howard Phou, a manager at YAO. "I see myself ordering more." Phou said some bottles are sold unopened to patrons for $88 a pop, almost three times their retail price, while others are used to mix lychee martinis. Despite the challenges, some are using the tequila example as a template for success the U.S..
"Patron was the first ultra-premium tequila to come out, and then the 'me-toos' followed," Trusch said. "When more people come onto the market, you'll have more people singing baijiu's praises."